Derived from the VT models of the 1930s, the Saturno was first seen in 1940. Up to the end of production in 1956-57, it was one of the most renowned of all Italian competition big singles. Though the speed versions recorded their last success in 1952, the Saturno made a dramatic come back as a motocross mount. The first venture by the Saturno into motocross in 1948 was made by a privateer who did away with the rear suspension. The same year, modified touring 500 Saturnos competed in the International Six Days' Trial at San Remo. But the first real transformation of the speed Saturno into a motocross machine occurred in 1951, when the French specialist Melioli modified both the frame and the gearbox. That inspired the factory to build its first motocross machine, which won the Italian title from 1953-56 and the French championship in 1954-55. The motocross Saturno was produced from 1952-56 and was little changed from the speed model – same power, same compression ratio, same carburetor. Only the gear ratios were changed so that the best use could be made of the big single's torque. Gilera officially retired from competition in 1957 but was still represented in enduro by modified touring two-strokes and then, after 1968, by dedicated enduro models. The marque only returned to motocross in 1976, in the 125cc category. 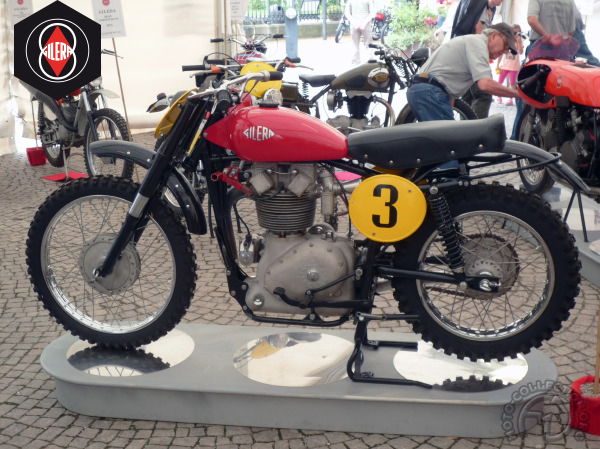 The Gilera Saturno was the only motocross four-stroke single ever catalogued by this great Italian marque.